About two weeks ago I was interviewed over at Epicenter Bitcoin. We covered a number of topics, some of which were previously covered by a few recent guests of the show (such as Robert Sams, Vitalik Buterin and Preston Byrne). This episode also spawned a number of comments over at Reddit this past week, where I responded to a couple of people. One clarification I would like to make regarding a specific comment I made on the show. At around the 53 minute mark I discuss something called “trusted transparency.” Guy Corem, CEO of Spondoolies Tech (an Israeli-based mining company) reached out to me this morning and explained that there is a misunderstanding and the area he is working on is more akin to an odometer. I’ll probably write something up later next month as more information becomes public. Also, the usual caveats: these alone are my opinions and I could be incorrect. This past week Koinify and the Cryptocurrency Research Group (CCRG), a new academic organization, held a 3-day event — the first of its kind called Cryptoeconomicon, an interdisciplinary private event that included a cross section of developers, entrepreneurs, academics and a few investors. It was purposefully scheduled to coincide with O’Reilly Media’s own “Bitcoin and the Blockchain” conference which took place in the middle of it. Rather than going through each session, I will just highlight a few areas that stood out to me and include outside relevant content. A formal discipline that studies protocols that govern the production, distribution and consumption of goods and services in a decentralized digital economy. Cryptoeconomics is a practical science that focuses on the design and characterization of these protocols. Economic mechanisms can give guarantees that a program will run in a particular way that cryptography alone can’t provide. How do we provide custom cryptoeconomic guarantees? Distributed consensus mechanisms can create a pure cryptoeconomy. Even the execution of the mechanisms is has a measurable assurance. I think the most apt comment from the economics discussion came from Steve Waldman, a software developer and trader over at Interfluidity on the first day of the event. While there will likely be a recording posted on Youtube (video), in essence what he said was that in the blockchain space — and specifically the developers in the room — they are creating an enormous amount of supply without looking to see what the corresponding demand is. That is to say, there is effectively a supply glut of “blockchain tech” in part because few people are asking whether or not this tech actually has any practical consumer demand. Where are the on-the-ground consumer behavior surveys and reports? Again, if Bitcoin (the overall concept) is viewed as an economy, country or even a startup, it is imperative that the first question is resolved: what is the market need? Who are the intended consumers? So far, despite lots of attention and interest, there has been very little adoption related to blockchains in general. Perhaps this will change, maybe it is only a temporary mismatch. Maybe it these are the chicken-egg equivalent to computing languages like Ruby or PHP and eventually supply somehow creates the demand? Or maybe it suffers from the Kevin Costner platform trap (e.g,. if you build it, will they come?). Maybe there is no real market need for these first generation concepts? Perhaps the network will run out of block rewards (cash incentives) to the miners before these blockchains can gain mainstream traction? Maybe the current developers are not quite right for the job? Or maybe, blockchains such as Bitcoin simply get outcompeted in the overall marketplace. For instance, there are currently 1,586 Payment startups listed on AngelList and 106 P2P Money Transfer startups listed on AngelList. 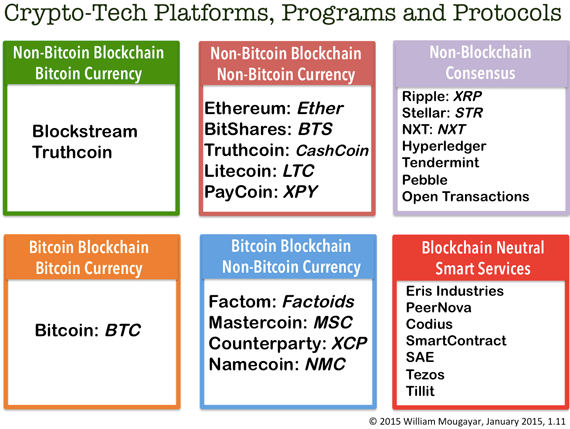 Most of these will likely burn out of capital and cease to exist, but there are probably at least a dozen or so of each that will (and have) gained traction and are direct competitors to these first generation blockchains. We cannot know for certain a priori what market participants will decide. Perhaps Bitcoin is good enough to do everything its enthusiastic supporter claim it can. Now, to be fair, Collison (who was not part of the event) has a horse in the race with Stellar. Fortunately there was not much emphasis on token prices going to the moon at the Cryptoecon event. When incentives did come up, it was largely related to how a consensus mechanism can be secure through a self-reinforcing Nash equilibrium. There were a number of startups at the event, probably around a dozen or so. In my view, the most concise overview was from Sergey Nazarov co-founder of SmartContract. The interface was clean, the message was clear and “issuance” can be done today. I’m not necessarily endorsing the stack he’s using, but I think he has clearly talked to end-users for ease of use feedback (note: be sure to consult a lawyer before using any ‘smart contracting’ system, perhaps they are not recognized as actual “contracts” in your jurisdiction). Also, drones. It would have been nice to see a little longer debate between StorJ, Maidsafe and Filecoin groups. I think there was probably a little too much “it just works” handwaving but thought that Juan Binet-Betez from IPFS/Filecoin gave the most thorough blueprint of how his system worked (he also showed a small working demo). It was not recorded but I think messaging for Augur (a variation of Truthcoin) was pretty poor. Again, just my opinion but I was vocal about the particular use-case (gambling) proposed as it would simply bring more negative PR to a space smashed with bad PR. The following day other members of the team discussed other uses including prediction markets for political events (similar to what Intrade did). I am skeptical that in its current form it will become widely adopted because futures markets, like the CME, already do a relatively competitive job at providing this service for many industries and these decentralized markets could likely just attract marginal, illicit activities as has been the trend so far. I could be wrong and perhaps they will flourish in emerging markets for those without access to the CME-like institutions. There were about 10-12 people affiliated with Ethereum at the event, all of them were developers and none of them seemed to push their product as “the one chain to rule them all” (in fact, there was a healthy debate about proof-of-stake / proof-of-work within their contingent). I’ve been fairly skeptical since last summer when their team looked gigantically bloated (too many cooks in the kitchen) but they seem to have since slimmed down, removing some of the pumpers and focusing on the core tech. This is not to say they will succeed, but I am slightly less skeptical than I was 3-4 months ago. I also had a chance to sit down with a couple members of the IBM ADEPT ‘Internet of Things’ team. They held a ~3 hour workshop which was attended by around 20 people. The session was led by Henning Diedrich (IBM), David Kravitz (IBM) and Patrick Deegan (Open Mustard Seed Project). Again, even though I’ve paged through the ADEPT whitepaper, I was hesitant to believe that this was little more than marketing on the part of IBM. But by the time the session was over, I was a little less skeptical. Perhaps in the future, when more appliances and devices have secure proplets, they could use a method — such as a blockchain/cryptoledger — to securely bid/ask on resources like electricity. B2B and machine-to-machine ideas were discussed and piggybacked on. Obviously there are all sorts of funny and sad ways this could end but that is up for Michael Bay to visualize next year. 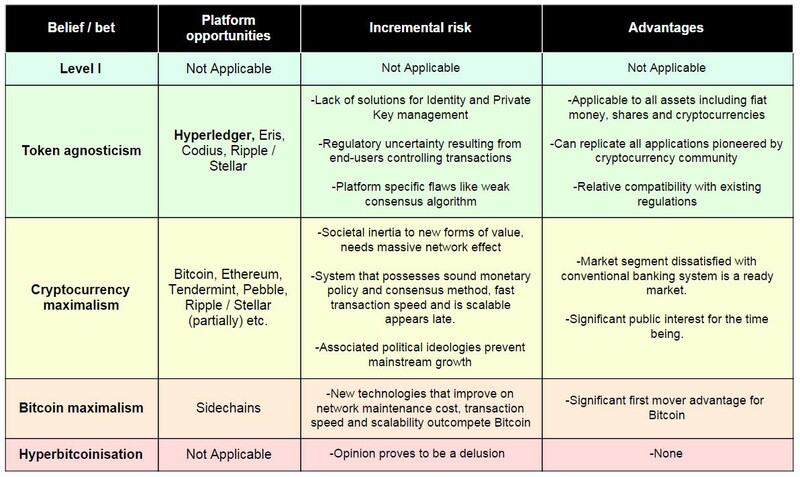 This also intersects with another good comment from Stefan Thomas (CTO of Ripple Labs). In a nutshell, on a panel during the first day, he thinks there is some confusion and conflation of the terms “automation,” “decentralization,” “smart contracts” and “blockchains.” That is to say, while blockchains are automated, that is not to mean that it is the only means to achieve automation. Nor is decentralization necessary for automation to be achieved in every use-case. Nor are smart contracts the only way to control automated devices. When the video is posted I’ll be sure to link it (video). Ethan Buchman, lead dev for Eris, was both witty and on top of his form, noting that in practice users don’t need a new browser every time they go to a new site, so they shouldn’t need a new client to view a different blockchain. Let’s keep our eye on Decerver to see how this germinates. Lastly, the two investors that attended the VC panel on Wednesday included Shahin Farshchi from Lux Capital and Pearl Chan of Omidyar Network. What I liked about them is they weren’t pushing a certain binary viewpoint. They were both upfront and honest: neither had invested in this space, not because they hated it, but because they were taking their time to see what opportunities actually fit within their mandate. Perhaps they will at some point. One joke that Farshchi mentioned was that back when cellular telephony was growing, “everyone and their mom” was selling base station equipment and chips. Similarly there were over 300 companies creating thin film solar cells before bankruptcies and mergers. So the type of euphoria we see in the Bitcoin-space is not necessarily unique. Perhaps if there is a next event it could include representatives from Blockstream, Bitfury and other Bitcoin-centered projects. It would be nice to have some perspective from those deeply concerned about with maintaining secure consensus and the Blockstream team has some of the most experienced engineers in this space. Hearing their views next to what Peter Todd (who attended and had some interesting calculations for the estimated costs to attack a network), could help developers build better tools. Similarly, developers from Peernova, Square, Stripe, M-Pesa and Western Union would also likely be good resources to provide empirical feedback. Additional clarity for what a decentralized autonomous organization (DAO) actually is and is not could be spelled out as well. And how do these intersect with existing legal jurisprudence (can they? as Brett Scott might ask). For anyone who has read “The Cookie Monster” by Vernor Vinge, both Matt Liston and Vitalik Buterin made some not-entirely-unreasonable points about machine-rights and whether or not machines should trust humans (e.g., humans expect bots to provide truthful information, but can the reverse be expected? And what happens if a bot, like a DAO, is deemed too successful or broke a law in some jurisdiction — does it get “carted” away in a truck?). Lastly, I think by the time there is another event, there will hopefully be more clarity for what a “smart contract” is. One panel I moderated, I tried to get the participants to use the word “banana” instead because the term “banana” is overused and often conflated to mean many things it is legally not. Primavera De Filippi from the Cryptolaw panel made some good comments too about whether or not “bananas” are actual legally binding contracts; she previously did a workshop with Aaron Wright (also in attendance) at the recent Distributed Networks and the Law event held at Harvard/MIT. Steve Omohundro also spoke realistically about these scenarios on the final day, where does liability start and stop for developers of DAOs? Slicing data: what comprises blockchain transactions? 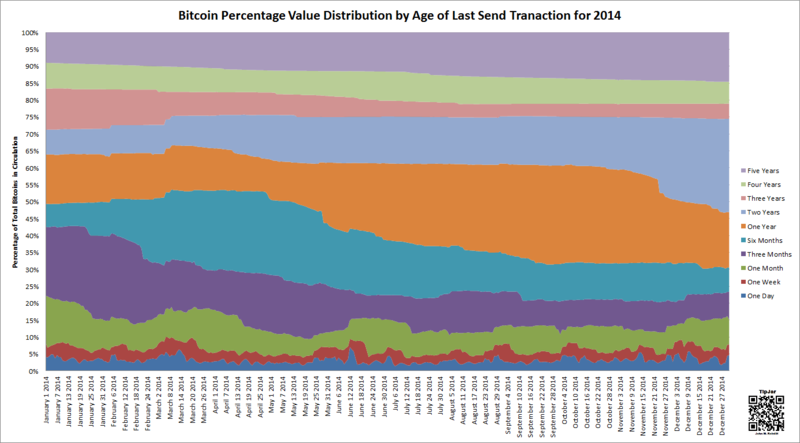 Over the past month we have seen nominal transaction volume on the Bitcoin network reach several all-time highs. Enthusiasts on social media have proposed any number of theories including a rise in retail payments or commercial volume. Yet upon further inspection, there does not appear to be a silver bullet answer. For instance, questions have arisen over a series of what some call “long chains.” Last month several commentators on a popular thread on Hacker News identified thousands of small transactions originating from a single source.3 The source was continually sending transactions and paid transaction fees for each of them. The reason this struck many as odd as a rational actor would simply bundle the transactions together to save on transaction fees. While there are likely different motivations for doing so, one reason for why this was occurring was that the originating source was attempting to delink or otherwise mix and tumble coins to make it difficult to “dox” or identify the originating source. But it could also be a faucet and at one point even pools paid out miners using chained transactions, perhaps some still do. Is there a definition of long chains? Blockchain.info have implemented a heuristic to identify high velocity activity that is probably unrelated to real world commerce. 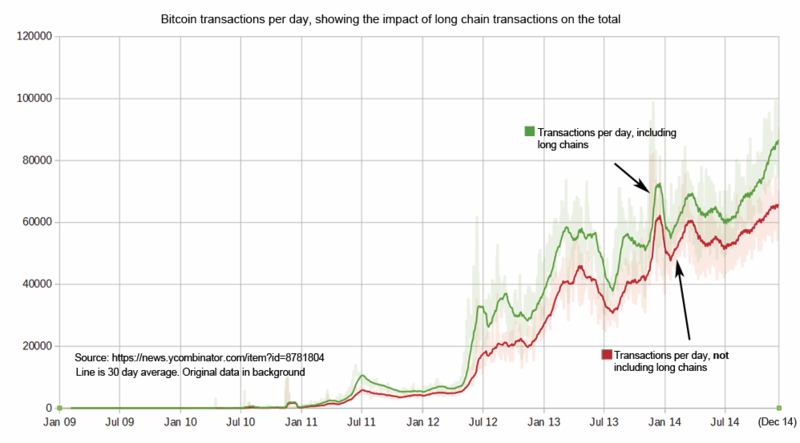 Every day the internal counter resets and counts how many times transaction outputs were spent on the same day. So if a wallet paid someone 1 btc in one transaction output and they then transferred that to cold storage that would be a chain of two. However there are some chains where the chain of spent outputs of a given day exceeds 1000. Each day, on average, the sample size is 144 blocks. Therefore, for chains of more than 144, the chain of transactions involve zero confirmation transactions (i.e., are not relying on the blockchain for their security). In other words, it is a measure of velocity. These long chains show that there are some parts of the economy that are flipping outputs almost 10 times a block with chains of over 1000 in a day. This may not relate to real world commerce or security processes, probably more likely to be gambling or mixing. In Satoshi Dice often the bettor just takes their winnings and gambles again with everything being done with 0 confirmations. Likewise with mixing there is little need to wait for confirmations and the priority is obscuring the origin of the transaction outputs. Finally this is unlikely to capture a lot of activity run by the centralised services since their objective is fee minimisation. As we can tell above, by removing these “long chains” the volume decreases by 3x, yet there does appear to be an upward trend over the past several months. The term “longest chain” is vague – it would be misleading to say it is just coin mixing. The volume could be a series of transactions where the user cannot spend to the desired destinations in the same transaction. This could be a limitation of their wallet software’s user interface, or the backend of the software itself. For instance, if a faucet is built on Block.io, the owner spends coins rapidly, sometimes breaking them into a couple transactions if they are efficient, and at other times into hundreds of transactions that spend unconfirmed change in rapid succession. We have seen chains of unconfirmed spends as long as 1,000 transactions, and they could be longer if blocks are not found. In the absence of a definite, no-non-sense way to look at “long chains” of transactions, the safest assumption would be to consider them as unconfirmed chain spends, where the user wants to spend transactions very quickly deliberately or due to their software’s limitation. Another potential source is even smaller. It is unlikely the long chains come directly from consumers because consumers don’t spend money rapidly. A more likely scenario is it is a ‘shared’ hot wallet operated by a service (e.g., Coinbase, Circle). A possible explanation then emerges – off-chain gambling sites such as Primedice / Moneypot / Betcoin casino and others operate hot wallets. In terms of scale, very small casinos may receive approximately 30+ deposits a day. A larger casino easily operate with 1000s of deposits a day and hundreds of withdrawals. One interesting behavior is that, bitcoin gamblers never keep funds in a casino. They tend to deposit, play and then immediately withdraw without leaving funds there overnight. That could create a huge amount of activities from the same hot wallet. Thus creating a large chain. What does this look like altogether? If long chains of transactions are used by entities of a very different nature to single transactions or short chains of transactions, then we might expect to see differences in transaction rates and transaction rate cycles between the short and long chain groups. Starting with a visual comparison of the two groups, the most significant difference between the longer and shorter chain groups is variance. This is to be expected since one long chain of transactions increases transactions rates more than a single, unchained transaction. Does the yellow line at the bottom represent the actual “real” volume? Perhaps, but maybe not. Perhaps a more useful test is to check for periodicity in the data. We know from previous work that currently transactions show a daily and a weekly cycle. I’m using Blockchain.info’s data which is daily, so a spectrogram will only reveal a weekly cycle. The last plot shows the spectrograms for chains longer and shorter than 10, 100, 1000, or 10000. 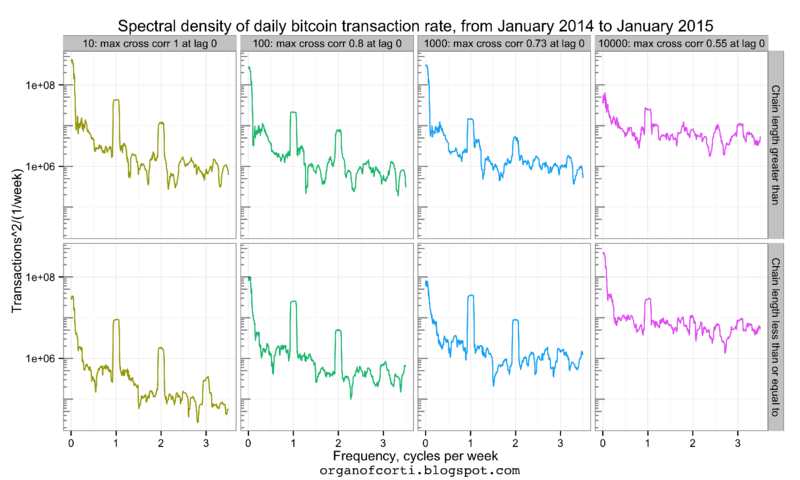 These show a periodicity similar to that for all transactions of one cycle per week. We can also compare transaction of chains longer and shorter than 10, 100, 1000, or 10000 by calculating the cross correlation function. In each case the maximum correlation is at lag 0 and is much higher than the upper bound of the 99.9 confidence interval, so the periodicity of the transaction rates of each group (chains longer and shorter than 10, 100, 1000, or 10000) are similar to, also suggesting that time of use for shorter and longer chain transactions are similar. Further, time series decomposition showed the same starting and finishing days of each weekly cycle. I think that a working week cycle implies that the larger number uses of longer chain transactions are from businesses with a normal working week, and the correlation in the periodicity of the shorter and longer chains of transactions suggests the largest use of both longer and shorter chains of transactions are by entities with a work days and weekends. Is there anything that explains the increase then? 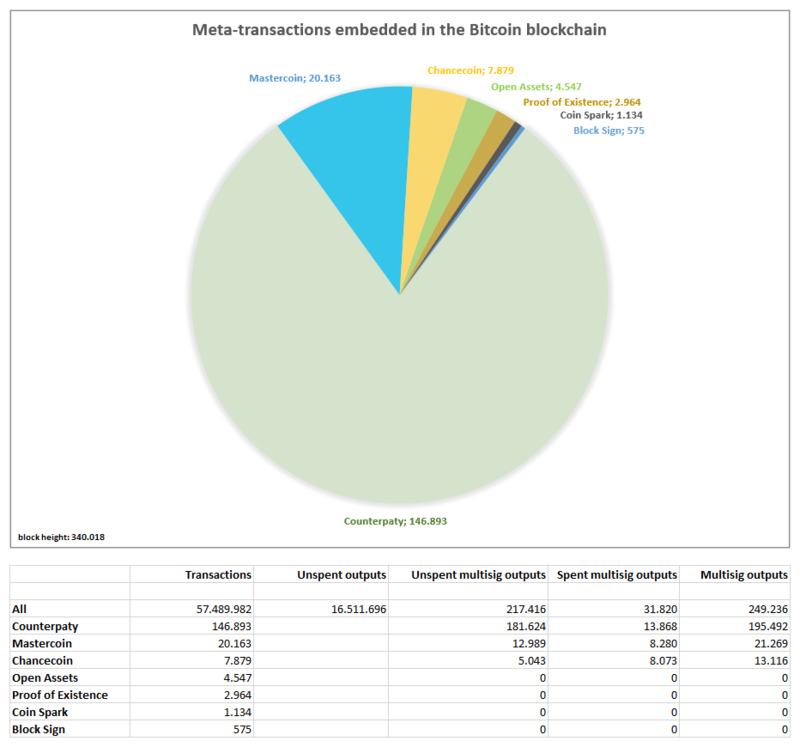 Almost all Counterparty transactions carry data via bare multisig and there are about 5000 non-multisig Mastercoin transactions. There are furthermore 17620 unclassified, unspent multisig outputs and 6286 unclassified, spent multisig outputs. Proof of Existence, Open Assets, Coin Spark and Block Sign account for 7363 OP_RETURN transactions. The total number of all OP_RETURN outputs, according to webbtc.com, is close to 11960, so more than 60 % can be mapped to those four. Last month, Jorge Stolfi a computer science professor in Brazil analyzed the BitPay addresses (BitPay reuses addresses) based on the Walletexplorer dataset.29 Below is a visual of what BitPay has received over the past two years. The green line on this graph shows the number of BTC deposited each day into that wallet.30 This graph is rather strange since the number is practically constant since January 2013, about 500–1000 BTC/day, and shows no weekly pattern. And no Black Friday spike either. In his analysis Stolfi also noticed two different types of orders processed by BitPay, what he labels “wholesale” versus “retail.” The “wholesale” coins are likely miners selling their block rewards in bulk whereas “retail” is consumer behavior (e.g., buying coffee, food, tickets). In terms of dollar value, the amount processed by BitPay (including “retail” and “wholesale” payments) has increased a lot from 2013 to 2014, but has fallen 50% or more since February, as the BTC price fell. Black Friday had a modest effect (2x to 3x) on the number of “retail” payments, but had no effect on the total BTC/day (which is dominated by the “wholesale” payments). And what about off-chain retail transactions? The noticeable pattern of higher activity on weekdays versus the weekend is apparent irrespective of holidays. Consequently, on most days these self-reported numbers comprise between 3-5% of the total transactions on the Bitcoin blockchain. However, as Jonathan Levin, has pointed out, it is not clear from these numbers alone are or what they refer to: Coinbase user to user, user to merchant, and possible user wallet to user vault? 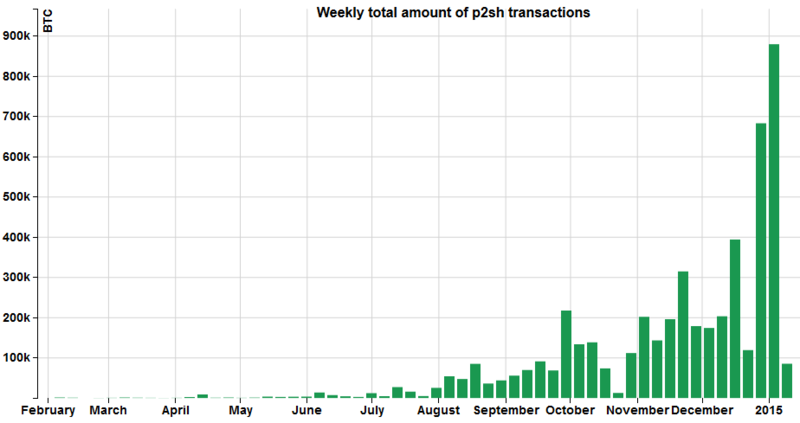 Another way of looking at whether or not transaction volume is increasing is through the “fees” to miner metric (recall that these are not real “fees” as they are not mandatory yet and may be more akin to “donations”).32 Maybe transaction volume based on the methods above does not fully capture hypothesized growth. 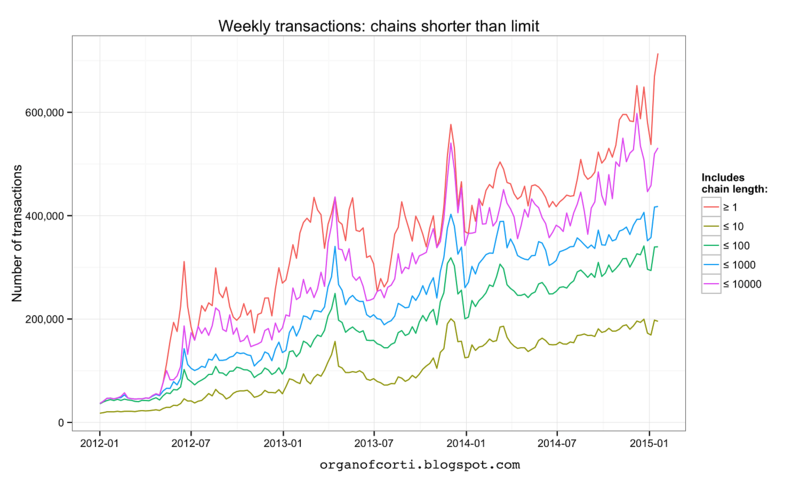 Above is a new chart from Organ of Corti which visualizes the transaction fees included with each block over the past 6 years.33 If on-chain retail commerce was increasing, it would likely in turn be paid for via some fee mechanism yet this is not apparent. This is not to say that utility has not increased for certain participants. Volume as a whole has clearly increased as shown by the second image – yet these are users who likely opt to send a fee-less transaction to the mempool (these transactions typically take several hours or perhaps a day to be included within a block). 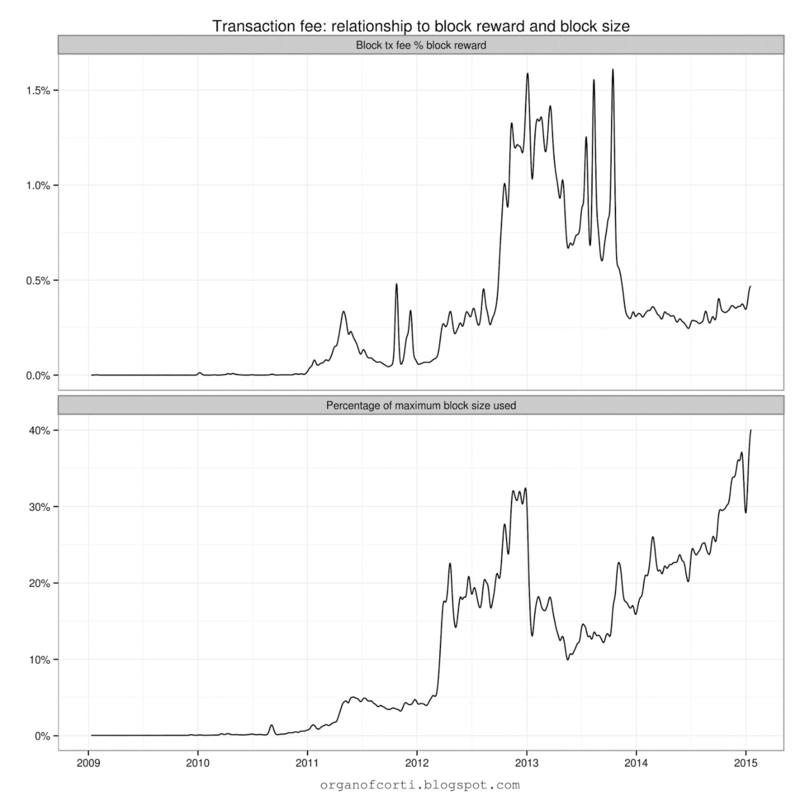 It does illustrate that the other narrative – that fees replacing block rewards – has not yet begun to occur. Maybe it will not. To put it another way, if more users were actively using the blockchain to transmit value, then it would likely be apparent via an aggregate increase in fees. 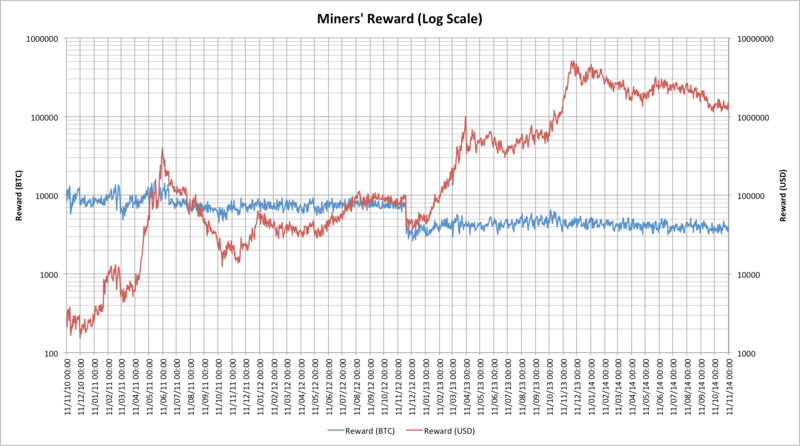 As shown above during a four year time span, miners, the actual labor force of the network, are not seeing the narrative play out as it is supposed to (block reward plus fees to miner). Denominated in bitcoin (the blue line), miners have not seen the increase in fees or revenue that many of the same social media promoters claim will happen. Whether this changes is unknown. Again, recall the current narrative that in the end, transaction fees will purportedly replace the block reward.36 But the causality is the opposite direction than assumed by most: fees people are willing to pay determine the number of miners. Not the other way around. The takeaway is that simply put, fees may not rise to cover the current block reward amounts. It may be that the block reward falls and miners just drop out and net transaction fees never increase reducing the security of the network but this is a topic for another article. 50 coin addresses, these are the only addresses in the very beginning due there being only miners on the network. However we see that this does not fluctuate a lot overtime and it indicates that most miners tend to cash out once they mined. Large increase in number of addresses with less than 1 bitcoin. This indicates more “retail” type buyers. Not much change or fluctuations to the large addresses. 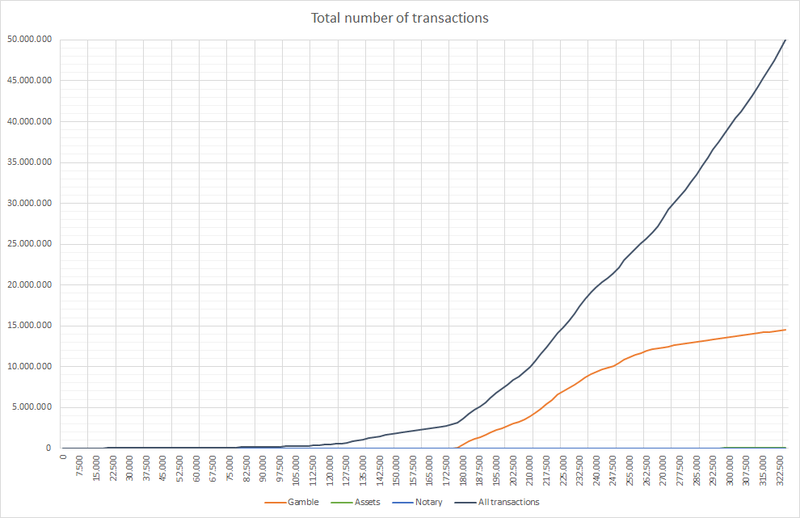 I think it is probably true that not a very large proportion of the transactions are retail transactions. In the long run, it doesn’t help the network. We can only wait for the next big innovative app that can boost retail-type usage. How else can this be visualized? John Ratcliff recently published several new charts describing “the State of the Blockchain Address(es)“ in which he delves into token movements and in particular “zombie” addresses (addresses that have not been active in 3 or more years).38 They are illuminating and we both disagree on conclusions that can be drawn from them. What does the chart above illustrate? If it is velocity then what the color bands reinforce my explanation from two months ago: that the majority of coin holders that were purchased in the November / December 2013 bubble are now underwater.40 We see the transition over the year, in which these coin holders, rather than spending and realizing a loss, hold on to them throughout the months. Hence, why we likely see another uptick to an “older” band starting in mid-November 2014 – the anniversary of the beginning of the most recent bubble. Figure 15 examines the degree of activity for the addresses in the network. For each date we partition the volume of addresses with positive balances according to their last activity. For example, the addresses that have transacted in the last week are likely to be frequently used (shown with the strip in the bottom). On the other hand, some of the addresses have not been active in the past 52 weeks. Those are likely to serve saving or investment purposes and much less so for transacting. From Figure 15 we can see that the volume of “investment” addresses (not used in the last year) has been steadily decreasing. Still, however, around 75 percent of the addresses in operation with positive balances have not been used in a transaction in the last four months. Broadly speaking, our empirical exercise documents general patterns of Bitcoin usage, and examines the use of Bitcoin for investment and payment purposes. We find that while the number of daily users may have doubled every eight months, the transaction volume is negligible compared to the domestic volume of U.S. payment systems. Our analysis of data from the Bitcoin system further suggests that Bitcoin is still barely used for payments for goods and services. In addition, the patterns of circulations of bitcoins and the dynamics of the bitcoin exchange rate are consistent with low usage of Bitcoin for retail payment transactions. Finally, we provide evidence that the exchange rates between bitcoin and other currencies are not well aligned, which we interpret as a lack of depth of the exchange markets and as costly exchange rather than unexploited arbitrage opportunities. Perhaps again, this will change in the future (e.g. Impulse),45 but going forward a full traffic analysis such as the type created by Sarah Meiklejohn et al. two years ago would help the industry as a whole determine what consumer behavior looks like with greater accuracy.46 And this is important for a project whose white paper promotes itself as a payment network for online commerce (see section 1). So what conclusions can be drawn from this? All we can say for now is that there is an increase in usage from multiple sources, but not likely from on-chain retail commerce which has remained flat for about a year. This is still a dynamic space and perhaps it may be months or even years before we will be able to fully identify all the major contributors to volume changes. Special thanks to dexX7, Raffael Danielli, Michael Dann, Dave Hudson, David Lancashire, TM Lee, Jonathan Levin, Atif Nazir, Organ of Corti, Jorge Stolfi, Ernie Teo and Sidney Zhang for their constructive feedback and time. It is largely based on an earlier presentation (older slides) I gave in Singapore in November plus a few more updated slides from my R3 talk last month (slides). Note: in order to listen and view you need to register (for free). How do Bitcoin payment processors work? Yesterday there was a discussion on a listserve about Brian Kelly’s hypothesis’ regarding bitcoin exchange rates and below is an answer I used to discuss where payment processors fit into the ecosystem. At their core BitPay is basically a forex company, a broker that matches merchants with liquidity providers. Microsoft and some 44,000 merchants can convert bitcoins into fiat through them (and/or hold portions or all of the coins they receive too). Some miners also use them to process BTC to USD. To do this, they have built an exchange (you can also call a few of their team members to place block orders with), which effectively sorts the bid/asks among other exchanges and OTC providers (such as Buttercoin, Mirror, Xapo, Sator Square Partners, Bitfinex, Coinbase, etc.). I tried describing some of how this plumbing system works in a article a couple months ago. Payment processors ultimately want commerce to flow so they do their best to match up partners; so in practice there has to be partner on the other end with the same or greater demand for the coins being sold by the consumer/merchant. I do not have exact numbers for how often #1 happens though I do understand it happens on a daily basis (again, the 15 minute window is to help lock in a price and the OTC demand from partners such as Coinbase may not be fast enough at times) or how often #3 happens (my understanding is US payment processors typically used to hold coins on their own books prior to the IRS ruling last year but have sold their inventory for tax purposes). Obviously during a heavily volatile period like yesterday (or even today on the upside), there is a possibility that the coins could get placed on the payment processors’s books due to a lack of bids on the OTC partners side, but none of that is really public knowledge. The point is however, that there has to be a demand side to absorb the sales of coins coming from merchants and payment processors have built some pretty good systems to handle that (incentivized in large part to limit their exposure to exchange rate volatility). If these partners were to disappear or the coins they decide to purchase declines in aggregate, payment processors are then left with having to choose #1 or #3. This doesn’t seem to be the case the last few days, the behavior seems to be on the exchanges themselves and not from merchants. The current supply pressure on a daily basis: aside from a couple firms such as BitFury (which according to some sources has around a ~$180 total cost of production), miners as a whole end up having to sell the majority of coins each day (~2,000 – 3,000+ coins) and as a whole, merchants process about 5,000 – 6,000 coins a day. So this means 10,000 coins x 365 days or 3,650,000 coins. Thus, to maintain a $300 price with that sell pressure the market needs to have ~$1 billion a year in capital come into this space. And to maintain a $1,200 price with the same merchant/miner behavior the market would need to have ~$4.4 billion. Therefore it is likely that payment processors try to reduce the amount of exposure to #3, otherwise the coins would eat up the internal budget and increase the burn rate at these startups. Note: what BitPay’s volume looks like in practice was recently summarized by analysis from Jorge Stolfi. The noticeable trend is that despite claims of their upcoming demise, neither appcoins nor altcoins stopped being created. 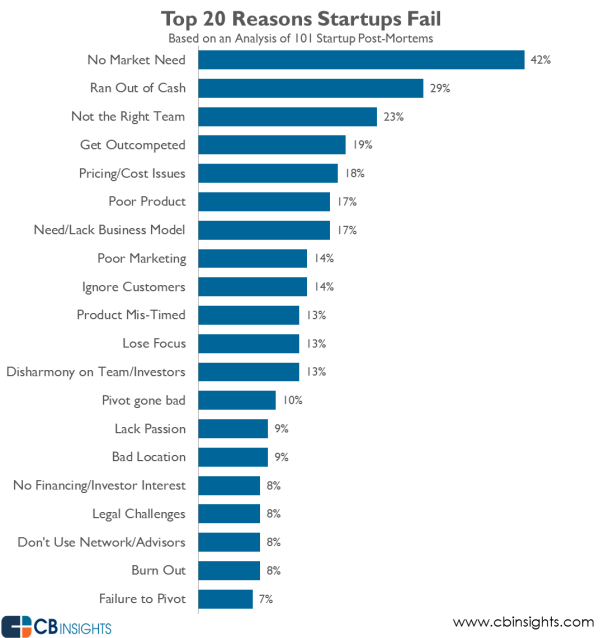 Perhaps this will change in the future, but portions of the cryptocurrency community as a whole seems to want to continue to try and fund projects in this way. On the face of it would seem as if this type of infrastructure (reusing a tested system like Bitcoin’s blockchain) would incentivize altcoin developers to move or start their project on one of these chains. But from a funding perspective, it may be cost prohibitive in that development teams need to be paid and historically have found pre-sales, pre-mining and pre-allocations – such as those above – as a way to fund continued development. How to compete with that? For example, according to Coinmarketcap there are currently 10 “coins” that have a ‘marketcap’ larger than $10 million (recall that Jonathan Levin’s definition of a ‘narrow money stock’ is probably more appropriate). While some coins are more liquid than others, it is unlikely that an entity like Blockstream could provide a similar amount of funding for those projects (perhaps they or others will set up a fund for this at a later date to do that). Either way, the merits of sidechains (there are multiple proposals, of which Blockstream’s is the farthest along) is a topic for another time. What about other methods of distribution such as “proof of burn”? Counterparty “burned” 2,130 BTC in January 2014 which effectively removed 0.01% of the monetary base. Dogeparty “burned” 1.85 billion dogecoin during 28 days in August/September 2014. Roughly equivalent to 2.01% of the monetary base at that time. What about airdrops and giveaways? XRP (from Ripple Labs) was distributed through the Computing For Good project where a user could earn points for contributing to the World Computing Grid. Because XRP were pre-allocated, this allows for a different distribution. It ended in May 2014 due to abuse by botnets. And over the course of the endeavor, roughly 0.002 XRP were awarded per WCG point. Stellar initially gave away up to 6,000 stellar per verified Facebook account but was quickly abused via oDesk / Mechanical Turk (a large majority of accounts were generated via abuse). For instance, Everett Forth received 2 million on launch day. Ribbit.me airdropped ~200 million RibbitRewards in December 2014 to 13,730 users. Let’s Talk Bitcoin grandfathered in previous contributors (e.g., writers, show hosts) to receive LTBCoins. 51 million LTBCoins were handed out in its first distribution on June 27, 2014. What does 2015 hold for these methods of fundraising and distribution? Perhaps they will indeed terminate as predicted, or perhaps market participants will use a different method of fundraising that has not been tried.